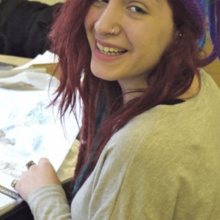 At London Art Portfolio, we work with students from all over the world. Some are simply looking to get into a top UK university or art college, which in most cases involves applying through UCAS and they require application support – more details are on our UCAS page. Many people, however, are looking for something different in regards to application support. We’re pleased to say that we can help almost any student of art, design or architecture to learn, to prepare for and to apply to the college or university of their choice, whether in the UK, France, Italy, the USA, Scandinavia or anywhere else, and to assist with career development. In short, wherever you are from, whatever stage you are at, we can help take you where you want to be. If you’re at school in the UK – we can help you raise grades at GCSE, A Level and International Baccalaureate (IB). If you need extra qualifications – for example a 4th or even 5th A Level to demonstrate your all-round abilities. Even if you plan to study something different at University, such as languages, an extra A level in art can help. If you would like to develop your critical thinking – this is something that all leading universities and colleges wish to see. Any of our arts courses can help, but we particularly recommend our summer courses, which include critical contextual studies, examining and debating historical and contemporary art, design and architecture. If you want to study Art History – a certain amount of history of art is built in to all our art courses, but we also offer dedicated art history courses via specialist tutors. If you’re studying for an MA – whether directly for an MA in art or design, or to complement your studies in another subject, our courses can make a real difference. If you are an education agent – we are always happy to work directly with you as required. Foundation and Degree courses – some UK university and college courses fall outside the UCAS system. In addition to UCAS applications, we can assist with personal statements and applications for a wide range of universities and colleges. MA applications and proposals – MA application support can include advice on what to study and why, suitable bibliographies, research proposals. MA applicants also need references, which we may be able to supply. Career change – many people studying for an MA are looking to change careers. Examples of people we have helped to move to a more art- or design-focused field include neuroscientists, barristers, social workers, business people, economists, psychotherapists and marketing professionals. Career enhancement – some people may be starting their careers, or searching for a new focus, re-direction or promotion, which will require extra skills or qualifications. For example, an art therapist will need an art portfolio. London Art Portfolio has a genuine interest art, design and architecture education around the world. Some of our students choose our portfolio development courses to prepare successful applications for top EU and international universities. Director Julia Dennis studied her Masters in International Education Development (University of Sussex, Centre for International Education Development). She has played an active role in EU and British Council funded art education projects with countries such as Finland, Belgium and Sweden. She has worked with UNESCO and the Commonwealth Secretariat in Oceania too. Julia has taught in a breadth of university art schools in London, Italy and Papua New Guinea. Tutors at London Art Portfolio are all freelance professional designers and artists who run their own design companies in the UK, many of whom are from different parts of the world too, such as UK, Italy, Germany, Uruguay and Cyprus. London Art Portfolio is experienced and up to date with course structure and content of the International Baccalaureate, both in and outside the UK. 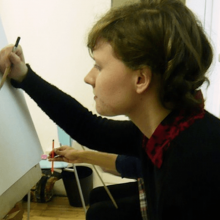 We give additional support and direction to students who wish to use their London Art Portfolio experience to enrich and raise the grade of their final baccalaureate mark. Equally, we are highly qualified in the support and delivery of the UK and international AS/A2 Level system. We are able to help you raise the level and grade of your A Level studies in art and design. We are familiar with the application requirements for many universities and art colleges around the world at many levels, including Degree and Masters. We are have successfully helped students with entry into leading institutions within the EU and around the world. These include: the USA, Italy, France, Denmark, the Netherlands, Germany, Mexico, Sweden, Argentina, Dubai, Australia and many more. 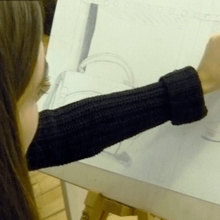 At London Art Portfolio you have the opportunity to learn new skills, such as drawing, idea development, design development and fine art outcomes. Experienced tutors will give you personal support and encouragement to develop independent thinking to nurture your inner creativity. Through this process you will be taught critical and contextual ways of thinking, seeing and analysis of ideas and debate. You will have the opportunity to develop as an individual and within a group to exchange ideas. We have the knowledge and ability to give you quality career support and direction with your whole university application process. If you’re planning a year abroad in London – we can give you the support and advice you need to build up and prepare your successful portfolio. We could be part of your year abroad – you can choose our 24 week or 18 week portfolio enrichment programme can be part of your year abroad. In addition you may wish to supplement it with one to one tuition, or a study trip to Italy. Whether you’re finishing a degree course or planning to start work at 16 or 18, looking for your first proper job can be a daunting prospect, especially in the field of art and design. Our tutors have experience teaching BTEC courses for 16-18 year olds, and understand what employers are looking for. 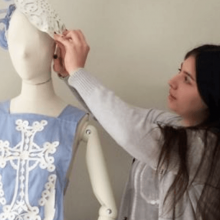 We also have a good track record in helping students get placements or internships, and many of our students have gone to successful careers in many art-related fields, including leading fashion boutiques, retail chains, design practices and more, while several have gone on to teach art and design themselves. Applications and personal statements – we’ll help your refine your application and any personal statement to ensure it stands out for all the right reasons. For more details of UK applications, please see our UCAS page. Which university or college? – as well as all leading UK universities and colleges, we have a good knowledge of many leading institutions worldwide. The right course – if you’re not sure what to pursue, we can help you make the best decisions for you through application support sessions. Where to look for jobs or placements – we know which are the best UK employers to target, and can help you launch, progress or re-focus your career. Personal skills – including interview techniques, confidence building and so on can be extended through our application support tutorials. Filling in the gaps – whether in terms of practical skills, knowledge, or in areas such as independent thinking, collaboration and critical thought. Education agents – we are always happy to work with or advise education agents as well as their clients. As you can see from our many recommendations, we have a great track record across the board. We would love you to be our next success story!